Objectives: The purpose of this study was to identify the incidence, outcomes, and risk factors of postoperative abdominal bleeding after living-donor liver transplant. Materials and Methods: Adult patients who had living-donor liver transplant between 2001 and 2013 were evaluated. Preoperative and intraoperative variables of transplant recipients were analyzed retrospectively with univariate analysis. Cox proportional hazards regression model was used to identify independent factors for postoperative bleeding. Results: There were 241 living-donor liver transplant recipients included in the study. Postoperative abdominal bleeding was observed in 12 recipients (5%). The 3-month cumulative survival was sig-nificantly lower in recipients who had postoperative bleeding (survival, 8 patients [67%]) than recipients who did not have postoperative bleeding (survival, 204 patients [89%]; P = .009). Univariate analysis showed that preoperative albumin level, Child-Pugh class, and intraoperative blood loss were risk factors for postoperative bleeding. In multivariate analysis, intraoperative blood loss and Child-Pugh status were significant risk factors for postoperative bleeding. Conclusions: Living-donor liver transplant recipients who had postoperative bleeding had a poor outcome. Postoperative bleeding was associated with higher intraoperative blood loss and Child-Pugh class. Postoperative abdominal bleeding is a potentially life-threatening complication after liver transplant and often requires surgical treatment.3 Delay in the diagnosis and treatment of postoperative abdominal bleeding may cause death. Identifying the cause of postoperative bleeding is necessary to decrease the incidence of this complication. However, most previous studies about postoperative bleeding were performed with deceased-donor liver transplant, and few studies are available in patients after living-donor liver transplant.4,5 It is unknown whether risk factors for bleeding after deceased-donor liver transplant are applicable to living-donor liver transplant. Therefore, we evaluated the incidence, outcomes, and risk factors for postoperative abdominal bleeding after living-donor liver transplant. All patients who had adult-to-adult living-donor liver transplant using the right hepatic lobe without the middle hepatic vein from 2001 to 2013 at our center were reviewed retrospectively. Transplant recipients were divided into 2 groups: (1) recipients who had postoperative abdominal bleeding and (2) recipients who did not have postoperative abdominal bleeding. All transplants were approved by the ethics committee of West China Hospital, Sichuan University. All protocols conformed with the ethical guidelines of the 1975 Helsinki Declaration, and informed consent was obtained from all subjects. Continuous variables were reported as mean ± SD and analyzed with 1-way analysis of variance. Categorical variables were analyzed with the chi-square test or the Fisher exact test. Independent risk factors were identified with Cox proportional hazards regression model. Factors significant at P < .10 in the univariate analyses were evaluated with multivariate analysis. The Kaplan-Meier method with log-rank test was performed to compare the short-term survival of the 2 groups. Statistical significance was defined by P ≤ .05. A total of 241 living-donor liver transplant recipients were included in the present study. 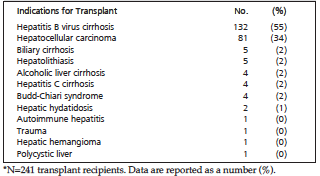 The most common indications for living-donor liver transplant were hepatitis B virus cirrhosis and hepatocellular carcinoma (Table 1). Mean age was greater for recipients than donors, and recipients most frequently had Child-Pugh class B (Table 2). Most recipients did not have postoperative bleeding (Table 3). The mean graft-to-recipient–weight ratio, intraoperative transfusion volumes, and surgical duration were similar between recipients who had or did not have postoperative bleeding (Table 3). Mean intraoperative blood loss was greater for recipients who had postoperative bleeding than recipients who did not have postoperative bleeding (Table 3). In the 12 recipients who had early postoperative abdominal bleeding, 9 patients had reoperation, 1 patient had interventional embolization, and 2 patients died of bleeding. The postoperative bleeding occurred from the cut surface of the graft (4 patients), retrohepatic region (2 patients), subhepatic region (2 patients), diffuse surface exudation (2 patients), adrenal gland (1 patient), and subdiaphragmatic region (1 patient). There were 29 recipients who died within 3 months after surgery, including 4 patients who had postoperative bleeding (33%) and 25 patients who had no postoperative bleeding (11%) (Table 3). 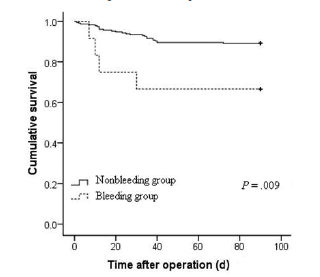 Survival at 3 months was significantly greater in recipients who did not have postoperative bleeding (Table 3 and Figure 1). The causes of death included multiple organ failure (14 patients), infection (9 patients), renal failure (3 patients), bleeding (2 patients), and graft rejection (1 patients). Univariate analyses showed that risk factors for postoperative abdominal bleeding in recipients included preoperative albumin level, Child-Pugh class, and intraoperative blood loss (Table 3). Multivariate analysis showed that intraoperative blood loss and Child-Pugh class were independent risk factors for postoperative abdominal bleeding in recipients (Table 4). Postoperative bleeding is a potentially fatal complication and often requires urgent surgical treatment. The current study showed that living-donor liver transplant recipients who had postoperative abdominal bleeding had low short-term survival (Table 3 and Figure 1). 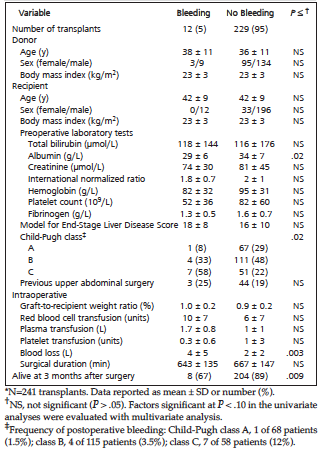 Preoperative intraoperative blood loss and Child-Pugh class were independent risk factors associated with postoperative abdominal bleeding after living-donor liver transplant (Table 4). The frequency of postoperative bleeding observed in recipients in the present study (5%) was lower than previously reported (8.4% to 14.4%).3-5 A possible reason for this difference may be the different amount of intraoperative blood loss at different centers. The mean intraoperative blood loss observed in this study (Table 2) was lower than previously reported.3-5 In addition, intraoperative blood loss was an independent risk factor for postoperative abdominal bleeding after living-donor liver transplant (Table 4). Living-donor liver transplant includes an additional cut surface on the graft than deceased-donor liver transplant. In the present study, the cut surface on the graft was the most common intra-abdominal bleeding site. In a previous study, the hepatic artery was the most frequent site of bleeding that necessitated laparotomy after liver transplant.3 In the present study, hepatic artery reconstruction was performed by a vascular surgeon, and a low incidence of hepatic artery complications was observed.10 During liver transplant, the graft may develop an ischemia-reperfusion injury that may cause graft loss or primary failure to function.11,12 In addition, recipients may have a hypocoagulable state after liver transplant. Early postoperative thrombocytopenia is common after liver transplant because of platelet activation and consumption after graft reperfusion.13,14 These factors may increase the incidence of postoperative bleeding. Living-donor liver transplant is a complex procedure that is associated with potential massive intraoperative blood loss that may prompt massive transfusion of blood products. Massive blood loss during liver transplant may be associated with poor preoperative coagulation status, varicose collateral vessels, technical difficulties, or low preoperative platelet count.15 Intraoperative massive blood loss may cause consumption of clotting factors, further compromising coagulation function in recipients. This may explain the finding that massive intraoperative blood loss was a risk factor for postoperative bleeding after living-donor liver transplant (Table 4). A similar conclusion was noted with thyroid and pancreas surgeries.18,19 Intraoperative blood loss may be a risk factor for early reoperation because of varied complications after living-donor liver transplant.8 In contrast with other studies, red blood cell transfusion was not an independent risk factor in multivariate analysis.4,20 In the present study, intraoperative autologous blood transfusion was used for patients with benign liver disease, and intraoperative allogeneic red blood cell transfusion did not parallel the intraoperative blood loss after living-donor liver transplant. In addition, other studies have shown that massive intraoperative blood loss and blood product transfusion may be associated with high postoperative morbidity and mortality after liver transplant and other operations.21-24 The mean volume of intraoperative blood loss was greater in recipients who had postoperative bleeding than recipients who did not have postoperative bleeding (Table 3). Reoperation, which may further compromise the patient’s condition, also may cause higher morbidity and mortality in patients who had postoperative bleeding after the primary transplant procedure. Child-Pugh class was another independent risk factor associated with postoperative bleeding, and the frequency of postoperative bleeding increased with increased Child-Pugh class (Tables 3 and 4). Patients who have high Child-Pugh class may have severe varicose collateral vessels, poor preoperative condition, severely enlarged spleen, and coagulation dysfunction, and these factors may cause massive intraoperative blood loss and necessitate blood product transfusion.15 Other studies have shown that higher preoperative Child-Pugh class is an independent risk factor associated with massive intraoperative transfusion, and that Child-Pugh class A may be a protective factor for massive intraoperative bleeding after liver transplant.25-27 In addition, preoperative international normalized ratio and presence of ascites may correlate independently with the amount of blood transfusion after liver transplant.28 Patients who have advanced Child-Pugh class have poor preoperative coagulation status and massive ascites. In conclusion, postoperative bleeding is associated with poor short-term outcome after living-donor liver transplant and is independently associated with massive intraoperative blood loss and advanced preoperative Child-Pugh class. Bhangui P, Vibert E, Majno P, et al. Intention-to-treat analysis of liver transplantation for hepatocellular carcinoma: living versus deceased donor transplantation. Hepatology. 2011;53(5):1570-1579. Li C, Wen TF, Mi K, Wang C, Yan LN, Li B. Analysis of infections in the first 3-month after living donor liver transplantation. World J Gastroenterol. 2012;18(16):1975-1980. Jung SW, Hwang S, Namgoong JM, et al. Incidence and management of postoperative abdominal bleeding after liver transplantation. Transplant Proc. 2012;44(3):765-768. Liang TB, Bai XL, Li DL, Li JJ, Zheng SS. Early postoperative hemorrhage requiring urgent surgical reintervention after orthotopic liver transplantation. Transplant Proc. 2007;39(5):1549-1553. Kappa SF, Gorden DL, Davidson MA, Wright JK, Guillamondegui OD. Intraoperative blood loss predicts hemorrhage-related reoperation after orthotopic liver transplantation. Am Surg. 2010;76(9):969-973. Li C, Mi K, Wen TF, Yan LN, Li B. Outcome comparison of right hepatectomy for living liver donation versus for hepatic patients without cirrhosis. J Gastrointest Surg. 2011;15(6):982-987. Li C, Mi K, Wen TF, et al. Outcomes of patients with benign liver diseases undergoing living donor versus deceased donor liver transplantation. PLoS One. 2011;6(11):e27366. Yoshiya S, Shirabe K, Kimura K, et al. The causes, risk factors, and outcomes of early relaparotomy after living-donor liver transplantation. Transplantation. 2012;94(9):947-952. Yang Y, Yan LN, Zhao JC, et al. Microsurgical reconstruction of hepatic artery in A-A living-donor liver transplant: 124 consecutive cases without HAT. World J Gastroenterol. 2010;16(21):2682-2688. Totsuka E, Fung JJ, Lee MC, et al. Influence of cold ischemia time and graft transport distance on postoperative outcome in human liver transplantation. Surg Today. 2002;32(9):792-799. Pérez Valdivia MA, Gentil MA, Toro M, et al. Impact of cold ischemia time on initial graft function and survival rates in renal transplants from deceased donors performed in Andalusia. Transplant Proc. 2011;43(6):2174-2176. Richards EM, Alexander GJ, Calne RY, Baglin TP. Thrombocytopenia following liver transplantation is associated with platelet consumption and thrombin generation. Br J Haematol. 1997;98(2):315-321. Senzolo M, Burra P, Cholongitas E, Burroughs AK. New insights into the coagulopathy of liver disease and liver transplantation. World J Gastroenterol. 2006;12(48):7725-7736. Dagi TF. The management of postoperative bleeding. Surg Clin North Am. 2005;85(6):1191-1213. Association of Anaesthetists of Great Britain and Ireland, Thomas D, Wee M, et al. Blood transfusion and the anaesthetist: management of massive haemorrhage. Anaesthesia. 2010;65(11):1153-1161. Spahn DR, Rossaint R. Coagulopathy and blood component transfusion in trauma. Br J Anaesth. 2005;95(2):130-139. Promberger R, Ott J, Kober F, et al. Risk factors for postoperative bleeding after thyroid surgery. Br J Surg. 2012;99(3):373-379. Welsch T, Eisele H, Zschäbitz S, Hinz U, Büchler MW, Wente MN. Critical appraisal of the International Study Group of Pancreatic Surgery (ISGPS) consensus definition of postoperative hemorrhage after pancreatoduodenectomy. Langenbecks Arch Surg. 2011;396(6):783-791. Hendriks HG, van der Meer J, de Wolf JT, et al. Intraoperative blood transfusion requirement is the main determinant of early surgical re-intervention after orthotopic liver transplantation. Transpl Int. 2005;17(11):673-679. Chung HS, Jung DH, Park CS. Intraoperative predictors of short-term mortality in living donor liver transplantation due to acute liver failure. Transplant Proc. 2013;45(1):236-240. Bennett-Guerrero E, Feierman DE, Barclay GR, et al. Preoperative and intraoperative predictors of postoperative morbidity, poor graft function, and early rejection in 190 patients undergoing liver transplantation. Arch Surg. 2001;136(10):1177-1183. Araz C, Pirat A, Unlukaplan A, et al. Incidence and risk factors of intraoperative adverse events during donor lobectomy for living-donor liver transplantation: a retrospective analysis. Exp Clin Transplant. 2012;10(2):125-131. Hendriks HG, van der Meer J, Klompmaker IJ, et al. 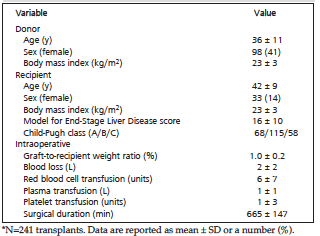 Blood loss in orthotopic liver transplantation: a retrospective analysis of transfusion requirements and the effects of autotransfusion of cell saver blood in 164 consecutive patients. Blood Coagul Fibrinolysis. 2000;11(Suppl 1):S87-S93. Boin IF, Leonardi MI, Luzo AC, Cardoso AR, Caruy CA, Leonardi LS. Intraoperative massive transfusion decreases survival after liver transplantation. Transplant Proc. 2008;40(3):789-791. Roullet S, Biais M, Millas E, Revel P, Quinart A, Sztark F. Risk factors for bleeding and transfusion during orthotopic liver transplantation. Ann Fr Anesth Reanim. 2011;30(4):349-352. Esmat Gamil M, Pirenne J, Van Malenstein H, et al. Risk factors for bleeding and clinical implications in patients undergoing liver transplantation. Transplant Proc. 2012;44(9):2857-2860. Acknowledgements: Chuan Li and Tian-Fu Wen proposed this study; Chuan Li collected and analyzed the data; and Lu-Nan Yan and Bo Li contributed to the discussion. This work was supported by a grant from the National Science and Technology Major Project of China (2012ZX10002-016 and 2012ZX10002017-006). The authors have no conflicts of interest to disclose.